Globalization requires an understanding and appreciation of other cultures. As nurses, we care for people from various cultures in many settings. International study is a valuable opportunity to enrich personal clinical experience and prepare nurses for future practice. The UNCW School of Nursing is dedicated to providing this opportunity to students. We encourage all students to consider a study abroad opportunity during their time in a SON program. For information about upcoming international opportunities during the 2018-2019 academic year, check back here for updates during the 2018 fall semester. 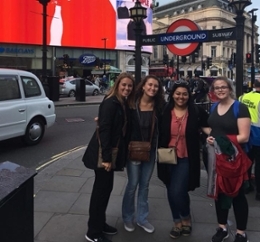 Assistant Professor April Matthias and Prelicensure program coordinator Brandy Mechling led a group of ten students to the United Kingdom. The travelers were immersed in the UK’s nursing history focusing on Florence Nightingale, the mother of modern nursing. Students explored the UK’s medical, public health, and healthcare history through walking tours, lectures, museums, commemorative events and more which allotted students the opportunity to experience the UK’s rich history. Students experienced and explored the culture of London and Edinburgh during free time and guided tours. Through exposure to UK's nursing and healthcare history, students gained first-hand experience to the importance of historical study for contemporary practice. Faculty and students spent five days in London, England and two days in Edinburgh, Scotland. During this time, students engaged in numerous educational activities and opportunities to heighten their understanding of nursing practice. While in London, students visited the Old Operating Museum, St. Thomas’s Hospital, and the Florence Nightingale Museum among many others. Students toured the Royal College of Nursing where they attended a lecture entitled “Working in a ‘World of Hurt’: Nursing Men with a Psychological Trauma during World War One" by Nurse Historian, Dr. Claire Chatterton. 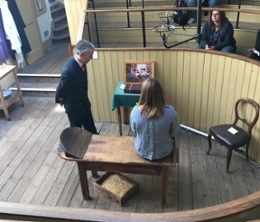 In Edinburgh, students visited Surgeon's Hall Museum and experienced a walking medical tour of the city. To experience British culture, students used their free time to engage in site-seeing and cultural events around the two cities. Travelers visited the Tower Bridge, Buckingham Palace, Westminster Abbey, The National Gallery, and Piccadilly Circus. They even got to experience a once in a lifetime opportunity which included traveling to Windsor and “attending” the wedding of Prince Harry and Meghan Markle. The wedding just so happened to fall on the same weekend students were traveling! To view more about this trip, visit their Facebook page by clicking here. The Clinical Research Program embarked on their first study abroad trip during Spring Break. Clinical Research Program coordinator Barb Pennington, CLR Lecturer Annemarie Petroff, and six students traveled to Buenos Aires, Argentina. There, they visited several clinical research specific organizations, including the PPD and IQVIA (formerly Quintiles) offices, an ethics committee meeting, the Austral University research site and Argentinean Ministry of Health (ANMAT), which is equivalent to the U.S. Food and Drug Administration (FDA). Student groups, and even PPD, have never before been invited to ANMAT. Students learned how regulations pertaining to the drug development and approval process in Argentina differ from the U.S. FDA system and noted several similarities in regulatory processes between the two countries. During the trip, representatives from the PPD and IQVIA offices spent considerable time with students and faculty to explain how these global companies work together with other offices, research sites, ethics committees and regulatory agencies throughout the drug and device development process. Local PPD contacts coordinated and joined the group on all research organization visits throughout Buenos Aires, assisting with travel logistics and Spanish translation. 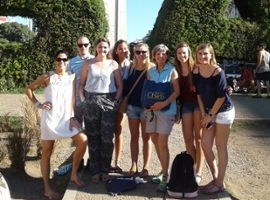 In their downtime, the group enjoyed cultural experiences such as a tango show, open air markets and a city bus tour. They visited La Recoleta Cemetery, where Eva (Evita) Peron, former first lady of Argentina, is buried and Buenos Aires Metropolitan Cathedral, where for 20 years Jorge Bergoglio, now Pope Francis, resided and officiated mass. For an application, financial aid resources and other materials, please visit UNCW International Programs. To learn more about past international programs trips, click here.